104 p., 15,5 x 23,0 cm. With contributions by Tilman Borsche, Rolf Elberfeld, Volker Gerhardt, Boris Hennig, Abraham Olivier, Matthias Perkams and Katrin Wille. Abraham Olivier: Was ist Schmerz? The major trend today is an attempt to offer a physiological explanation of all pain. This article raises the question: how can we define pain in physiological terms without underrating or denying its psychological dimensions. As an answer to this question, I propose a non-reductive physiological definition of pain that accounts equally for physical and psychological factors. Drawing on a wide array of sources I define pain as follows: pain is disturbed bodily perception bound to hurt, affliction or agony. This definition should help to rediscover the multiplicity of meanings of pain within a comprehensive framework. Katrin Wille / Rolf Elberfeld: Naturalismus oder Menschenbild? 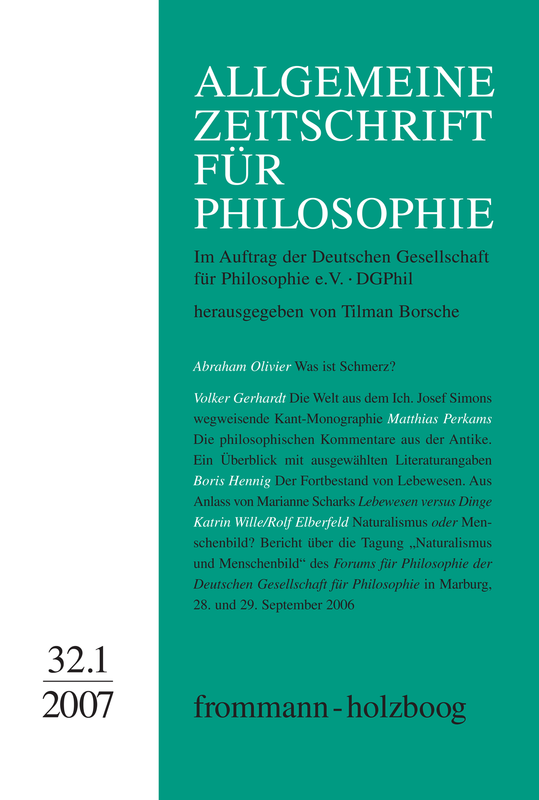 Bericht über die Tagung »Naturalismus und Menschenbild« des ›Forums für Philosophie der Deutschen Gesellschaft für Philosophie‹ in Marburg, 28. und 29. September 2006.